Tanita PC InnerScan Scale – Tracking Weight Loss | OhGizmo! By Andrew Liszewski on 10/18/06 • Leave a comment! There’s no doubt in my mind that one of the best motivations to weight loss is being able to see your progress over time. Once you lose that first few pounds and realise that the changes in diet and routine you’ve made are actually working it becomes a lot easier to stick it out. 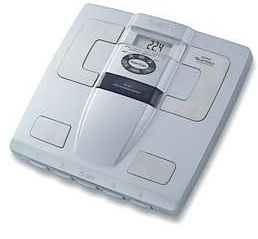 The Tanita PC InnerScan scale has everything you’d expect from a high-tech model including a digital display for your actual body weight as well as fat percentage readings. But it goes one step further by including a USB memory drive that allows those readings to be transferred to your PC (Windows-only) and graphed out via some included software. Unfortunately the USB key can only hold data for up to 4 users for a total of 30 days (how big is it? 4kb?) but thankfully the PC software can keep track of things quite a bit longer. The Tanita PC InnerScan can be found on Amazon Japan for around $130.